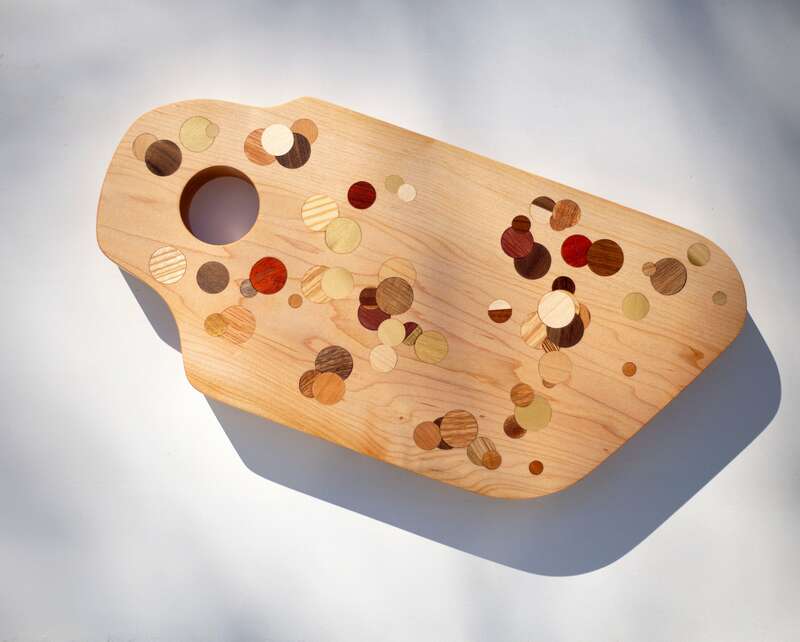 Light, bright, neutral tone Hard Maple, highlighted with hand cut colorful wood inlay polka dots. Each Yayoi starts with a hand picked cut of locally sourced Hard Maple. The board is cut, shaped and the polka dots are arranged by hand, making each board unique with its own individual color and design arrangement. At Untitled Co, we strive to provide a quality product that is designed for daily use. The things we use in life don't have to be boring, every aspect of our life should be a special one. Our products advocate for the enjoyment factor while keeping the buyer feeling great. With ever purchase, know that you are supporting the mission to lessen our global impact. We source our materials by connecting with the maker community, reaching out to large production shops to gather material that can be reused and repurposed. When we can't use recycled materials, we work directly with a small mom and pop saw mill in our area that specifically mills timber from our region, typically as the result of storm damage. This product is completely hand made, each piece is carefully selected before work begins on designing our boards. Attention to detail through our meticulously hand crafted process results in a stunning product that not only looks great but can and should be used in your everyday. After each board is sanded smooth, a healthy dose of food grade mineral oil is applies and the board is left to soak. Allowing a few days for the board to absorb the oil, we then apply our handmade board cream which helps protect and seal each board while also giving a final glow to the natural wood. Bigger, smaller, thicker, thinner? Let us know how we can provide you with a unique piece that is perfect for your kitchen. No project is too big and no idea too crazy, lets talk about it! They look really nice, just as described. Have been looking for something different to decorate a small place, this ones just fit perfect. 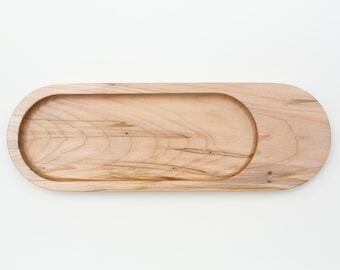 The wood air planter is beautiful. Bought them as a gift for my husband for his air plants and he loves them. Looks great on our wall. I was racking my brain for an idea for the long wall up the stairwell but not ending up with a cluttered noisy look can be tricky. I'm so relieved I found these! The wood ties in with the rest of the room and the plants add a clean, organic feel. Stuck fluorescent blub in stair well light fixture so hopefully that will keep them happy. Worst case scenario will just have to put fakes in the holders, but I think they'll still look good. Unfortunately, I couldn't show a good example of the whole stair well on here. Lightning fast shipping as well. I was expecting to have to wait for these so that was a nice bonus. At Untitled Co, we strive to provide a quality product that is designed for daily use. We believe that every aspect of life offers a potential for something special and unique. This should also include all the things we use in our day to day. Most importantly, we want this wonderful and unique product to be friendly to our environment. We go to great lengths to source material that is truly sustainable by connecting with the maker community and reaching out to large production shops to gather material that would otherwise end up in a landfill. We believe a product can and should last a lifetime, help us save the planet wont you? Unlike your typical run of the mill wood shop, we aren't ordering hundreds of board feet of timber to create our work. Instead, we collect materials sustainably by partnering up with local shops and makers to acquire unwanted or unusable material. From then we sort through and organize our recycled materials to begin the milling process. Once our material has been inspected, sorted and milled we can finally start the creation of our own products. We are proud to put in the extra time and energy spent to create using materials that have a past life and history to them. We hope to share these stories and educate our customers on the importance of sustainable design through our products. How do we finish our cutting boards? After the board have been sanded to a mirror finish they are ready for oil. 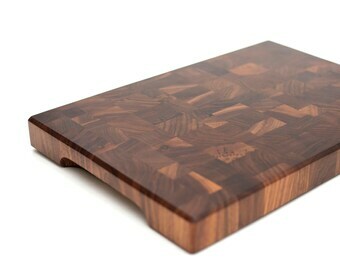 We let our boards soak in food safe mineral oil for a few hours. Wood is an organic, natural material so we allow the wood to absorb as much oil as it can, this keeps the wood happy and hydrated. After 24 hours we then buff on our natural board cream. The cream provides an extra barrier agains moisture. As you use the board, reapply oil and cream frequently to keep the wood healthy. Keep in mind, wood is an absorbent material, frequent oiling will prevent the absorption of things you don't want in wood like water or juices from foods. What? We don't have that exact thing you want? Of course we don't! We absolutely love working collaboratively with folks who are looking for something special. Feel free to send us a message to inquire about a custom order. We happily take wholesale orders! Just send us a message with details of what you are looking for and we will gladly accommodate your needs.